Pieris rapae, more commonly known as the Small White, is a small to mid-sized butterfly species of the Yellows-and-Whites family Pieridae. 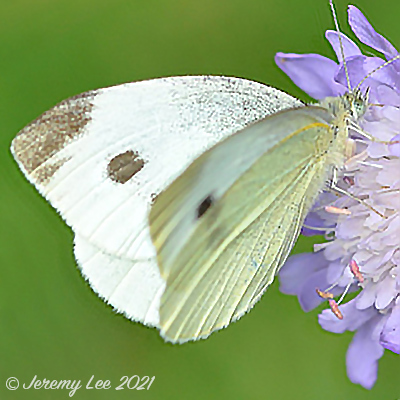 It is also commonly known as the Small Cabbage White. In appearance it looks like a smaller version of the Large White. The upperside is creamy white with black tips to the forewings. Females also have two black spots in the center of the forewings. Its underwings are yellowish with black speckles. It is sometimes mistaken for a moth due to its plain-looking appearance. Its caterpillars can be a pest on cultivated cabbages, but it will readily lay eggs on wild members of the cabbage family such as Charlock (Sinapis arvensis) and Hedge mustard (Sisybrium officinale). The eggs are laid singularly on foodplant leaves. The caterpillars are green and well camouflaged. Like other "White" butterflies it hibernates as a pupa, and like its close relative the Large White this is a strong flyer. The British population is increased by continental immigrants in most years.